New 15.6-inch TUF Gaming laptop delivers an immersive gaming experience without breaking the bank! 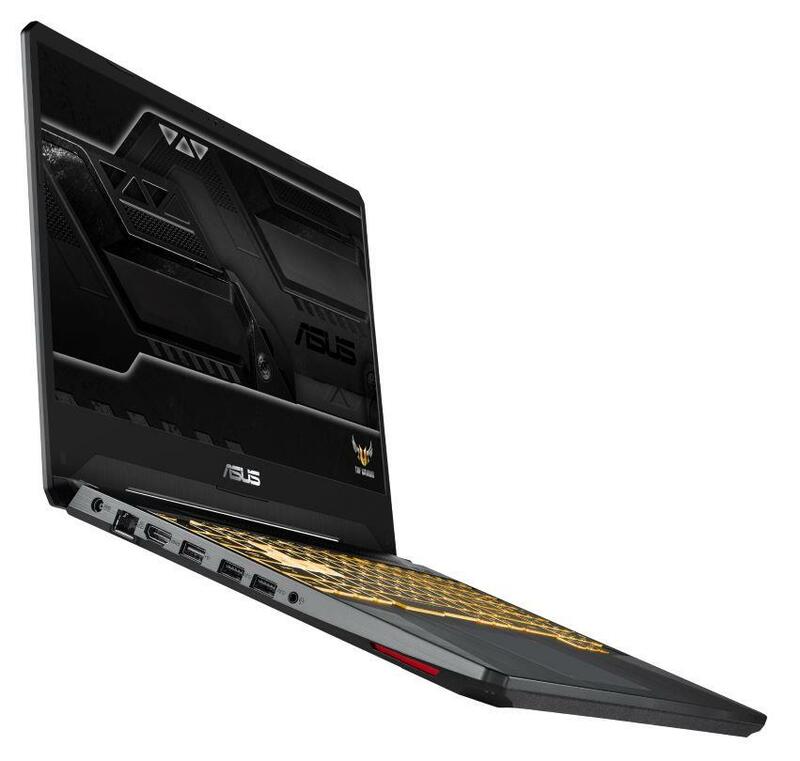 Singapore (7th December, 2018) — ASUS today announces the TUG Gaming FX505, durability-enhanced 15.6-inch gaming laptop that have been carefully engineered to deliver all the essentials needed for high-end gaming experiences at affordable price. The TUG Gaming FX505 features Intel® Core™ i7-8750H processors and NVIDIA® GeForce® GTX 1050Ti graphics, with immersive NanoEdge displays, gigabit Ethernet and gigabit-class Wi-Fi, and DTS surround-sound audio. The TUG Gaming FX505 is built to last over the long haul, with independent heatsinks and fans cooling the processors and discrete graphics separately, long-life keyboard switches, and clever patented anti-dust tunnel that provide long-term cooling and computing performance. The TUG Gaming FX505 is powered by an 8th Generation Intel® Core™ i7-8750H processors, a next-gen workhorse with six cores and 12 threads, not only capable of providing best-in-class gaming experiences, but also able to process multithreaded workloads much faster than the previous generation. It features a NVIDIA® GeForce® GTX 1050Ti graphics, supremely capable of high-framerate gaming at FHD resolution. 8GB of DDR4 2666MHz RAM, a 256GB PCIe® SSD, and a 1TB SATA hard disk ensure snappy Windows performance and fast game-load times. The TUG Gaming FX505 features a FHD IPS-level NanoEdge display, delivering smooth and clear gameplay that avoids blurring. The matte non-reflective displays cover the entire sRGB colour gamut and produce vivid colours even at wide viewing angles. The NanoEdge design features significantly slimmer side bezels than traditional laptops, providing an immersive visual experience and a reduced overall laptop footprint. The keyboards have an ample 1.8mm of key travel, and exclusive ASUS Overstroke technology raises the actuation point higher in the stroke to improve responsiveness, giving gamers an edge and making for a more comfortable typing experience at the same time. Inspired by desktop keyboards, the key caps are dished, the arrow keys are isolated, and defined gaps make the function keys easier to find. Backlighting comes in customizable RGB or a golden glow that matches the chassis accents. Audio also plays an important role in delivering high-quality, immersive gaming experiences. DTS Headphone:X® technology is integrated so that over headphones or speakers, preset profiles for games, movies, music, and sports can produce tailored audio experiences for every situation. Ensuring a stable internet connection with low latency is at the top of any serious gamer’s list of must-haves. The TUG Gaming FX505 features gigabit Ethernet ports for no-compromise gamers, as well as Intel’s latest 2×2 MIMO 802.11ac Wave 2 Wi-Fi, capable of making connections at speeds of up to 1.73Gbps[i] to compatible routers. It also has HDMI ports for connecting additional displays and two USB 3.1 Gen 1 ports and one USB 2.0 port for peripherals. As with all TUF Gaming products, the TUG Gaming FX505 is built to withstand everyday abuse. It has put through rigorous quality and durability tests that exceed industry standards, and passed the demanding US military-grade MIL-STD-810G test for sudden jolts. The HyperStrike keyboard uses switches rated for 20 million key presses. The reinforced chassis and hexagonal design on the bottom add structural rigidity to make them even sturdier. Proper cooling is critical to getting the most out of a gaming laptop. For this reason, the TUF Gaming FX505 feature HyperCool systems, with independent fans and heatsinks to cool the CPU and GPU separately. The design also places the fans directly underneath the keyboard to help remove heat, keeping the keyboard cool and comfortable during extended gameplay sessions. The patented trapezoid-cut lid allows more air to be ejected from the rear, improving cooling performance by up to 25% over traditional designs. Cooling performance can degrade over time, with dust and particle build-up impeding airflow through thermal fins: patented ASUS anti-dust tunnel help to guide dust and particles off to a separate chamber to be ejected from the system, keeping the thermal fins clear for stable long-term cooling performance. The ASUS TUF Gaming FX505 will be available at $1,898 starting from 12th December at ASUS Brand Shop Bugis and all authorised retailers.